Of these three time frames within which volatility can be considered, implied volatility is by far the most important. The nexus point is right here, right now, while the future is unclear and will always be that way. For an option trader to sustain profitability over long periods of time, it is essential to understand implied volatility and its various implications. Let us consider for a moment the variables defining an option’s price. Intrinsic value is a crisply defined value that requires simply the calculation of the relationship of the price of the underlying to the strike price of the option and can theoretically vary from 0 to infinity. The time value (also termed the extrinsic value) of the option is dependent, in large part, on two distinct variables. These variables are the amount of time to expiration and implied volatility. Time to expiration is easily defined by anyone with access to a calendar and schedule of option expiration dates. Option expiration is easily accessible for option traders, and as such represents a totally transparent variable. Conversely, implied volatility is not as easy to explain, or quantify. The subjective concept expressed by implied volatility is to be distinguished from the mathematically objective and precise concept of historic volatility. Historical volatility is simply derived from the price action of the underlying and can be calculated in one or more of several iterations. Each calculation is fundamentally derived from historically apparent price action. Implied volatility is not only arduous to understand, it is even more difficult to quantify. A totally different calculation is required; the computation is reflective of a unique and characteristic point of view with regard to price action. It is technically calculated by an iterative process requiring multiple trial and error calculations; thankfully the robust computational ability of the current generation of computers handles this task easily. Of the three primal forces impacting option price, implied volatility is the only factor subject to cerebration. As an adaptable and subjective input factor, implied volatility is reflective of both general market sentiment and the subjective evaluation of potential future volatility while simultaneously corresponding with the specific direction of the underlying. As such, it is a forward looking evaluation as opposed to historic volatility which is well, historic. Implied volatility has a historic and characteristic range for each underlying. A strong historic tendency is the characteristic for implied volatility to revert to the mean for the particular underlying under consideration. This strong mean reverting tendency forms one of the primary fundamental tenets of option trading and represents a major opportunity for potential profit in option trading. 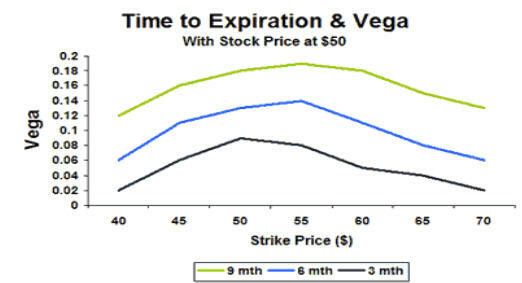 TheOptionsGuide.com produced the chart below that illustrates the behavior of Vega at various strike prices that are expiring in 3 months, 6 months and 9 months when the stock is currently trading at $50. In addition to the historic backdrop in which implied volatility may be considered, there are certain stereotypic patterns of IV expansion and contraction in relation to anticipated events which may lead to unusual volatility of the underlying. Classic examples of these events include earnings, impending FDA announcements, and the release of key economic data by the government or the analyst community. For example, many of the most extreme increases in implied volatility anticipate FDA decisions and routinely revert to the mean immediately following the anticipated announcement. Potentially substantial profit opportunities are borne from such situations for the adept and knowledgeable option trader. In future writings we will address the precise mechanisms by which perturbations in implied volatility can be exploited for profit by the knowledgeable option trader. Failure to consider the current position of implied volatility in a historic framework for the particular underlying in which you are contemplating a trade is the single most frequent hallmark of an inexperienced trader. Lack of attention to this important factor in trade planning is the most frequent cause of paradoxical option behavior and failure to profit from correctly predicting anticipated price movements of the underlying. While most equity traders focus their attention on the SP-500 for broad market clues, option traders always have a watchful eye on the volatility index, commonly known as the VIX. While the VIX is the most common volatility measurement in the option trading world, there are several volatility indices which can be monitored, followed, and even traded if one is so inclined. While it is not always necessarily the case, recently when the VIX rises, the broad markets are selling off. While this article has been a basic overview of implied volatility and Vega, it will conclude the series of recent articles which have been focused on the option Greeks. Forthcoming articles are going to be more focused on trades and the unbelievable profit opportunities that can be created by various option strategies. In closing, if you are interested in furthering your education regarding options my recommendation is to do some serious homework. Otherwise it will only be a matter of time before a combination of Theta, Delta, Vega, or implied volatility rear their ugly heads and take money from unsuspecting rookies.